Each month Scott M2 and Jamie Todd were joined by special guests to add their special flavours to the brew. It was a landmark year for dreamSTATE who had the great privilege of creating new ambient drone music live each month with these amazing soundartists. Beginning January 10th, 2012, on the "Chromatic Anniversary" of The Drone Cycle 2000, dreamSTATE launched the Cycle again, with new special guests performing with them on a wide variety of instruments, as they traversed the scale back downward: January in C, February in B, March in Bb... to bring the Drone home. dreamSTATE were very happy to have analogue visual greats General Chaos Visuals illuminating the entire cycle with their unique light paintings. All concerts were presented by THE AMBiENT PiNG and hosted by Supermarket at 268 Augusta Ave., Toronto. The first recorded fruit of The Drone Cycle 2012 has now been released - a new CD of winter-inspired soundscapes recorded in January with Heiki Sillaste. The album is titled The North Shore and is a numbered limited-edition of 250 copies in digipaks with glass mastered audio CDs and 4 signed artcards. The CD and MP3 versions of the album are available now through CD Baby. December 4th, 2012 ~ Beau Lukes (aka Sorcerer) helped dreamSTATE bring the Cycle to its conclusion performing on electronic hand percussion and an ancient drone instrument - the didgeridoo. Darren Copeland opened the evening by performing a special version of John Cage's Four.6 where all sounds designated for each performer in the score were derived from the archival recordings of dreamSTATE's previous 11 Drone Cycle 2012 concerts. The sounds were also matched with details of General Chaos' light projections from the Cycle. Darren performed the piece as part of worldwide celebrations for the 100th anniversary of John Cage's birth. Tuesday November 6th, 2012 ~ Terrence (Terry) O'Brien (aka Anomalous Disturbances) is a master of live-looping and quite a gear aficionado. dreamSTATE enjoyed his latest sounds and approaches to guitar, guitar-synth, treatments and looping. October 9th, 2012 ~ Synthesizers met the the sounds of instruments born before the Renaissance and played by modern masters, as dreamSTATE was joined by Ben Grossman on hurdy gurdy and electronics and Hugh Marsh on violin and electronics. September 11th, 2012 ~ dreamSTATE were very happy to have space guitarist Phil Ogison (The Devil In The Design, Amoeba Starfish) join the trip, along with the master of metal Alan Bloor (Pholde, Knurl), playing a fantastic instrument he designed - constructed from a very large saw blade and metal strings which he stroked, scraped and struck with violin bows, metal rods and bars. 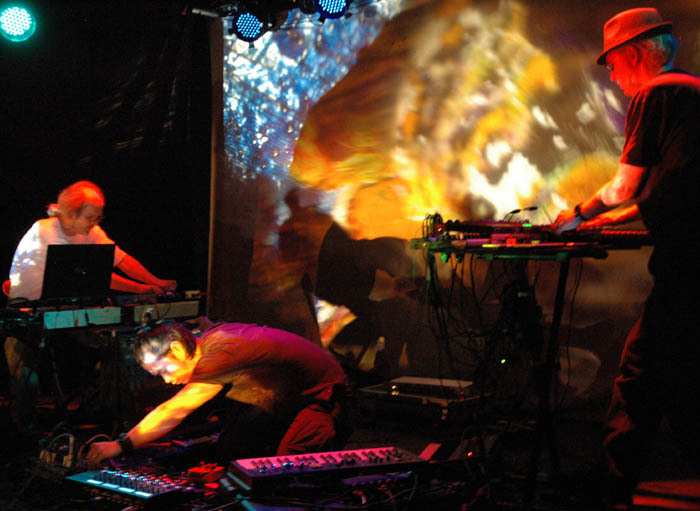 August 14th, 2012 ~ In the heart of summer, dreamSTATE's August theme was COLD, as they performed a super-chilled Drone Cycle set with the ice-blooded duo from Kalte - Rik MacLean (Mara's Torment) & Deane Hughes (Akumu). 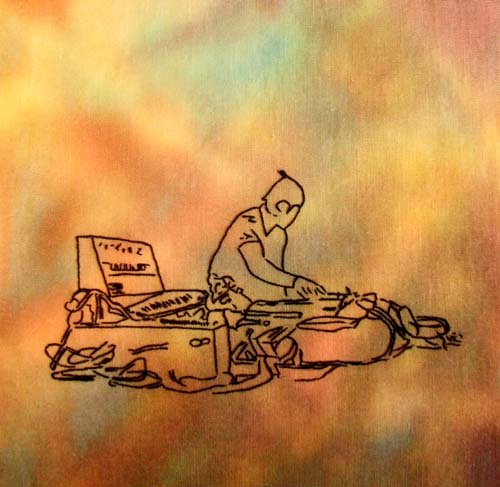 At this special show for THE AMBiENT PiNG's 13th Anniversary - the key was F for Freezing. Also as part of the PiNG's 13th Anniversary celebration on Tuesday August 14th, there was a special exhibition of artistic impressions Scenes from the Drone Cycle 2012 from shows January through June 2012 by fiber artist Lynn Harrigan. 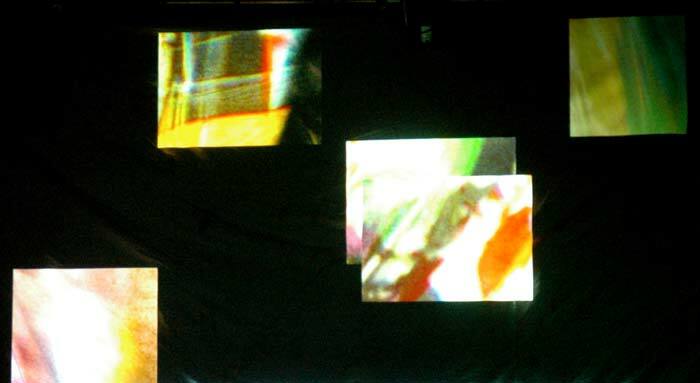 Scenes from the Drone Cycle 2012 by Lynn Harrigan. Byron Kent Wong - May 15th, 2012 by Lynn Harrigan. July 10th, 2012 ~ dreamSTATE performed for the first time with multi-talented wind player Rob Hoare (Geek Weekend), visiting from Berlin, and with their old friend, synthesist Steven Sauvé (Geek Weekend, karmafarm, quasiMODAL) who has performed with them many times - notably in the first Drone Cycle in July 2000. The key was F# for F#nky. 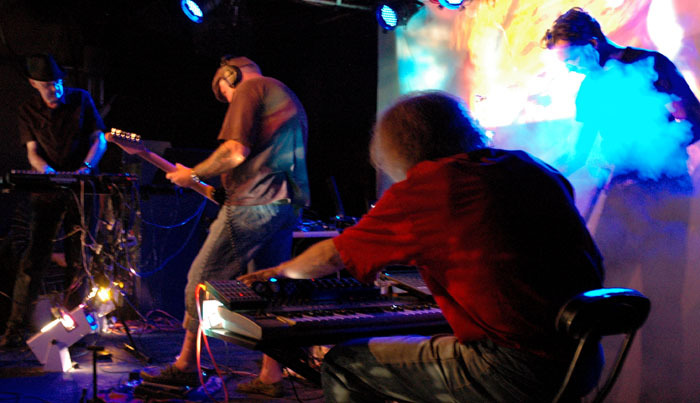 June 12th, 2012 ~ For this edition of the Cycle, dreamSTATE was joined by the three sound artists from Odradek: Andy Yue, James Bailey and Michelangelo Iaffaldano all on electronics - plus some acoustic instrumental work by Michelangelo. May 15th, 2012 ~ dreamSTATE's May Drone Cycle set was also a tribute to their friend and revered radio radical David Pritchard and their special guest was electronic producer Byron Kent Wong as they collaged electronics, live and prepared radio, transformed samples of David's voice and some never-released tracks which Scott mined from old demo cassettes and re-keyed into the drone note of G#. Byron brought along several vintage instruments - including David's old ARP 2600. Liz Janik (one of the last daytime DJs to program their own music at CFNY - a station where David was the original program director) was in the house to introduce the dreamSTATE set. 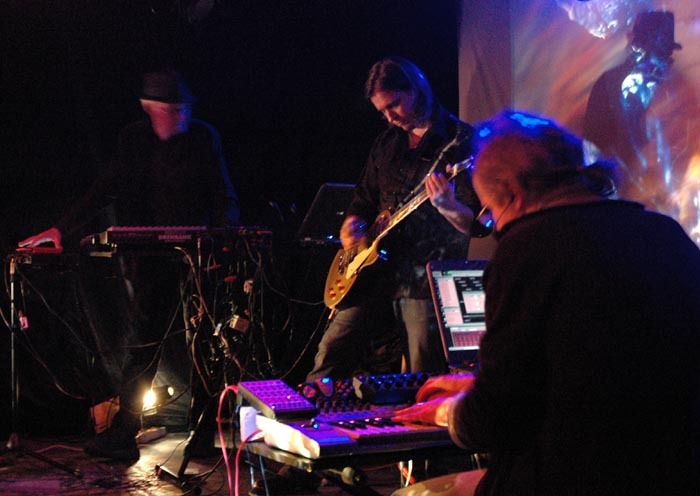 April 10th, 2012 ~ dreamSTATE was joined by Harry Kessels, of the Dutch/Canadian multimedia project Wave World, performing on theremin, voice and synthesizer. March 13th, 2012 ~ dreamSTATE's special guest was space-guitarist Jim Field of Northumbria, Spacenoiz and Rhea's Obsession. Jim tuned waaaay down to A# for this show. February 7th, 2012 ~ dreamSTATE's special guest was Matthew Poulakakis of Automatic Fats, Panoramaroid, Salvagesound, Wassonic, and NOiNO. Matthew performed wth samples and a variety of trinkets and found-sound objects. 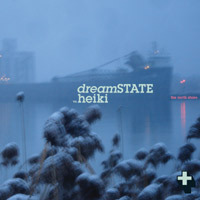 January 10th, 2012 ~ dreamSTATE's special guest for the launch of the Drone Cycle 2012 was electronic artist Heiki Sillaste, probably best known for his work in his groups Kinder Atom, Digital Poodle and Lazer Caps and his labels paper+sound, nice+smooth and Shadow Canada. Music from this concert appears on The North Shore - a limited-edition of 250 copies in digipaks with glass mastered audio CDs and 4 signed artcards.